A huge congratulations to Lyan who has achieved a Gold Certificate in Mathletics. That means she has earned over a 1,000 points a week for 20 weeks! Keep up the great work Lyan! Well done lyan that is so awesome. What time did you start? Well done Lyan congrats on your new gold certificate I have a qustion for you how long did it take to get the gold medal? Well done Lyan! That is amazing that you achieved the gold certificate! Good work Lyan you must of done lots of hard work. you are fantastic great work! Nice work Lyan, you must have been working at night. Awesome Lyan, you got a gold award. Hello it's Kiesha. I like how you have used your best to achieve your goal. Do you think your mum and dad will be proud of you? Lyan you are good at all sorts of stuff, but maths you are really good at. You are a good friend. Well done Lyan that's awesome. Its amazing how a year can change someone at math! How many hours did you stay up to get this achievement? Well Done Lyan for getting a gold medal. 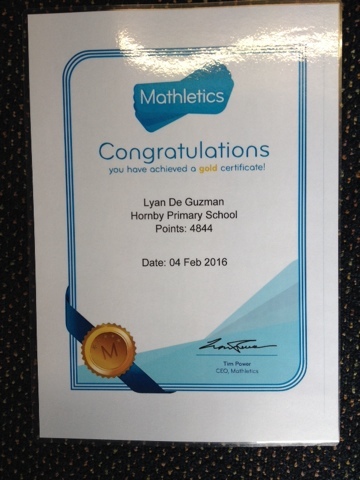 Well done Lyan I hope you are proud of yourself, you're really great at Mathletics. You should be proud of winning a gold medal. Well done Lyan that must have taken you days. Well done Lyan for getting a gold certificate well done you must be so happy to get a gold certificate. Congratulations Lyan on your Gold Medal! You have obviously persevered and worked very hard to achieve this - a great example of Personal Best! What is your next goal? Wow Lyan that must have taken a very long time, well done. Wow Lyan you must be pored of you Lyan. Well done Lyan thats great. Hello my name is Amber and I am from Owairaka School in Auckland. 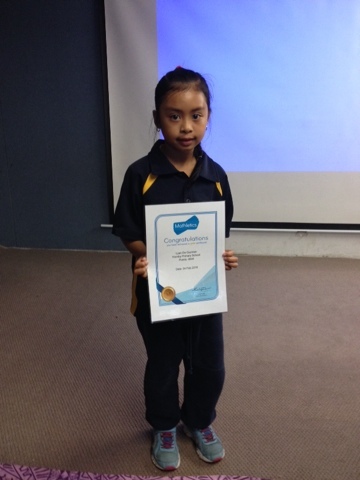 Congratualations to Lyan for your mathletics award. Well done! Hi my name is Brooke. I'm from Owairaka District School. Well done Lyan keep up the great work. Hi my name is Jordana. I'm from Owairaka District School. Well done Lyan and nice job. Keep up the great work. Hello my name is Marshall and I am from Owairaka School. Congratualations Lyan you must be one smart Girl. Hello my name is Janice. I'm from Owairaka District School. Congratulations! Well done, keep it up Lyan. that is an great award keep it up I hope you get another one. Hi my name is Bruno,from Owairaka School. You look like a great learner,and really good at mathematics too. Hi my name is Cole i am from Owairaka. good job. Hi lyan Good job you really Good on Mathletics. Hi my name is Arman from Owairaka District school. You did a good job getting a gold certificate. Keep it up. Good job Lyan. How long did it take you to get a gold.